The RB-PMX4 10 Input, 4 Output Analogue Preset Mixer. The RB-PMX4 is a high performance 10 mono input to 4 mono output pre-set mixer. 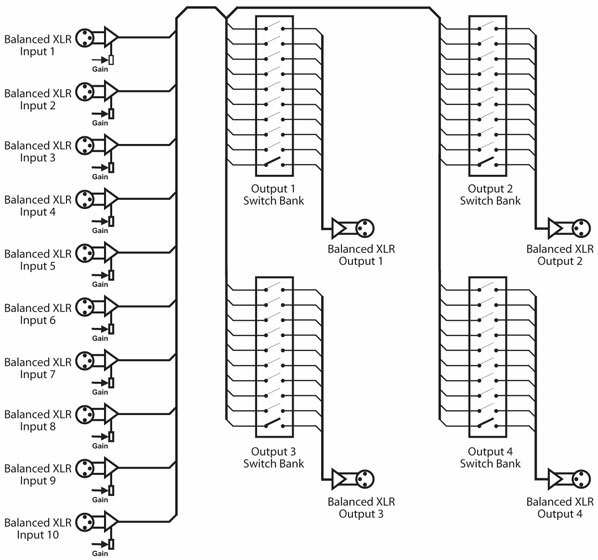 Each of the four outputs has a 10 way DIP switch associated with it to select which of the 10 inputs are routed to it. So, by altering the DIP switches, any of the input sources can be mixed to any of the outputs. The DIP switches are enclosed by a screw-on cover on the front panel so that the settings can not be accidentally changed for secure applications. The RB-PMX4 has been designed for situations where a small mixer is needed for installations where it will be configured and then only altered occasionally, or never altered at all. Uses for this product are numerous including a four bus mini-mixer, a multiple clean-feed generator, a 4 zone mixer for pubs and clubs and a quad stereo to mono converter to name a few. The XLR-3 inputs and outputs are electronically balanced and can be wired unbalanced. Each output is individually buffered so that a short circuit on one won’t affect the others. Each input has its own gain control which is a pre-set potentiometer accessible through the front panel. This provides gain adjustment of -8dB to +18dB. This is useful for normalising consumer and professional signals to give outputs of -15dBu and 0dBu respectively.